Hi friends! Happy Tuesday!! So excited for this post today - I'm teaming up with another great group of bloggers to bring you some fashion inspiration! 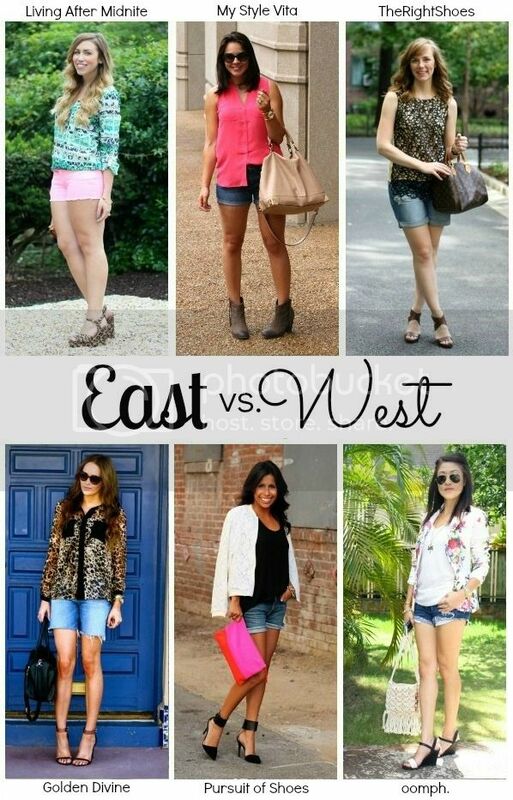 This time we're doing an East v. West styling face-off (tune in each Tuesday over the next four weeks!). Today we wanted to show you our denim shorts style. If you tune in tomorrow I'll share my favorite denim shorts. Check out everyone's full looks! Loving this top and those shoes are perfection! Can't wait for next week! Everything about this is perfect and I'm really loving the that top! great outfit...the detailing on your blouse is so pretty! i'm especially loving your bracelet! LOVE that top & your hair looks amazing!! Can't wait for next week's post!